Your love is a gem. This Valentine's Day, tickle their fancy with a perky pink bouquet, presented in a mirrored glass cube with hand-applied, pink ombre jewels! 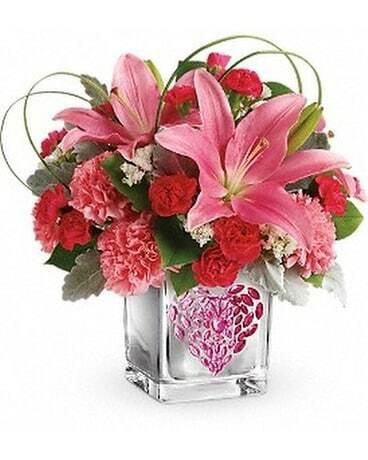 Pink asiatic lilies, pink carnations, hot pink miniature carnations, and white sinuata statice are arranged with dusty miller and lemon leaf. Delivered in a Young at Heart Cube.